In the small fishing port and resort town of Portreath in Cornwall, a stone’s throw from the beach, lies a small housing development called Rockville. The developer of the Rockville homes is Permisha Homes & Developments – a leading St Ives-based contractor, which also carried out the construction of the homes using its own team of sub-contractors. The architect on the project is Penzance-based architectural firm RLT Architects. Rockville has become one of the area’s most coveted developments. Comprising five four-bedroom terraced townhouses, each home features reinforced glass balconies on each floor that boast uninterrupted views of the beach. As well as boasting all the latest fittings and decorations, the homes are built to high energy performance standards, to exceed Part L of the Building Regulations. In short they in every sense provide a luxurious living environment in one of the most desirable areas of the Cornish coast. Why use the SIG360 service? Achieving a high build quality and good performance standards while ensuring construction remains cost-effective is a difficult balance to find. To determine the right combination of materials and construction techniques to use, a myriad of influencing factors were taken into account, from the specification of the products used down to the location and aspect of the property. Having worked with SIG360 on a number of previous projects, RLT got the team involved right at the initial design stage when it came to responding to the brief. This allowed them to provide value engineering expertise during the crucial design and specification phase. Working closely with the architect and the developer, SIG360’s technical team first carried out an extensive thermal performance review of the Rockville designs, including SAP calculations, u-value calculations and Energy Performance Certificate modelling. The Rockville properties used a complex combination of a timber frame (with internal insulation and reflective foil membranes) together with an external wall render system. As part of their evaluation, SIG360’s team reviewed this specification to ensure the most suitable and cost-effective materials were used. The early involvement enabled SIG360 to immediately identify that the original specification for the external render system could be revised to provide significant benefits. While the specified system sufficiently met performance requirements, it could only be installed by ‘approved applicators’ – the sourcing and management for which would have pushed up labour costs for the developer. SIG360 recommended an alternative solution of equal performance – a cladding panel with a thin render system – which could be installed by the developer’s own skilled workforce. On top of the labour costs saved, the material cost for SIG360’s solution was significantly lower, adding to the cost efficiencies realised. SIG360 also reviewed the roof insulation product specified for the Rockville properties. Having conducted a full thermal performance evaluation, SIG360 was able to change the roof insulation for an alternative, thinner material – reducing the build cost, but without affecting performance. While value engineering the specification for Rockville revealed a number of significant benefits – specifically in terms of generating savings – there were a number of other challenges the project faced which SIG360 needed to help the developer overcome. Due to the fact that the five townhouses are built into a cliff face at the edge of a beach, they could not be connected to the gas network. The developer was therefore keen to identify a cost-effective way of generating energy to power and heat the homes without relying solely on electricity from the grid (which can quickly lead to spiralling energy costs). To this end SIG360 worked with RLT and Permisha to investigate the possibility of using on-site micro renewable technologies. 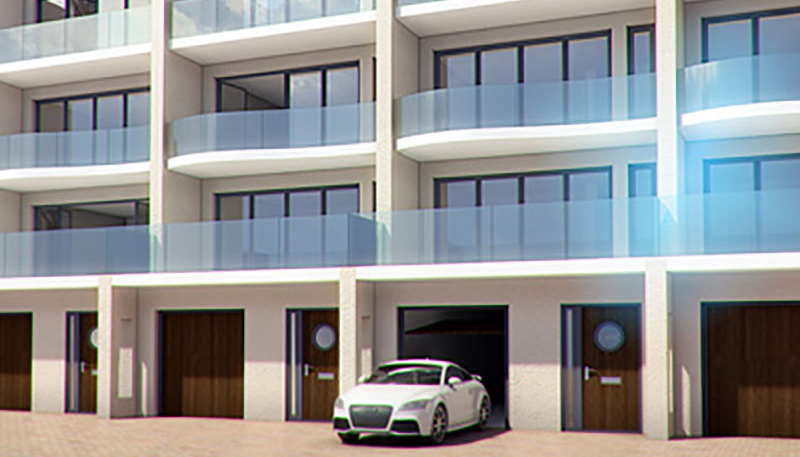 By factoring this into their SAP calculations, SIG360’s technical teams were able to recommend the use of an air source heat pump – which the developer and architect could then incorporate in the build design. Proximity of the development to the sea also meant the properties needed to be able to withstand constant exposure to the harsh marine environment. Indeed, the exposure levels were identified as being so severe, the British Board of Agrément Certificate for the external render system being used on the Rockville properties would have been invalid. Lack of a valid warranty on the external render system could have been a major issue for the developer, not least any prospective buyer faced with securing a mortgage and insurance. However with the help of SIG360, Permisha was able to get the warranty independently underwritten by the manufacturer of the system. SIG360 and Permisha then worked together to liaise with the Local Authority Building Control’s (LABC) Warranty Officer, who confirmed that the render system was suitable for the high-exposure application. The material and labour costs saved by reviewing the various product specifications for the Rockville project were significant. For the external render system alone, SIG360 enabled the developer to realise a saving of around £20,000; a significant saving achieved simply by ensuring the best product was selected for the job. In addition, by providing SAP calculations and technical guidance free of charge, SIG360 enabled the developer to effectively save the cost of employing a sustainability consultant. However it’s not just in the hard cost savings where SIG360 added value for the Rockville project. The insight and knowledge of SIG360’s technical team helped the architect and developer to shape the design and thermal performance of the build, ensuring that the finished product found the right balance between performance and cost-efficiency – despite the difficulties that the development’s location presented.